How to get on the program "Live healthy"
How to get on the talk show "Let them talk"
How to sign up for the program "Let them talk"
Number of programs by a variety of subjects is increasing every year. And because of their great popularity many seek to get on talk shows as a spectator. - contact editors, talk show. - the required clothing for filming. Decide which of the programs you are most interested. Find phones edition. You can either browse the titles, which may include contact information, or go to the website of the TV program. There's also read the terms and conditions of conducting a talk show. If your phone number was not successful, leave a request on the website. To do this, fill out the questionnaire, putting your contacts, in this case, the responsible persons of the editorial staff themselves. When the editor or his assistant will contact you, answer all his questions. Try to speak clearly, correctly and concisely. In conversation to Express their opinion about topics for future programs. Discuss in advance whether you will be able to announce it during filming. In case of positive response, think in advance of your speech, so when the shooting happens no incidents. Be sure to remember all of the recommendations, which will give the editor regarding the date of recording of the talk show and requirements to your appearance. Going on a talk show, don't forget to take your passport with you, without which you simply not miss. After verification by the staff of the television station that whether your name is in the list, and the verification of passport data, take the ticket. Better sit in the second row, then you will definitely notice. 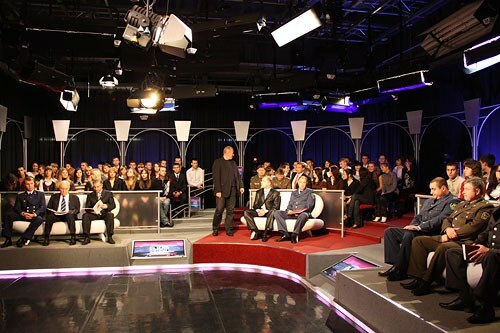 If you have agreed on a replica, keep in mind that any talk show limited. Don't be nervous, speak briefly and to the point, not engaging in spatial reasoning. Try to please the editor, and then he can invite you again.